In their pursuit of learning how our Universe came to be, scientists have probed very deep into space (and hence, very far back in time). Ultimately, their goal is to determine when the first galaxies in our Universe formed and what effect they had on cosmic evolution. Recent efforts to locate these earliest formations have probed to distances of up to 13 billion light-years from Earth – i.e. about 1 billion years after the Big Bang. From this, scientist are now able to study how early galaxies affected matter around them – in particular, the reionization of neutral atoms. Unfortunately, most early galaxies are very faint, which makes studying their interiors difficult. But thanks to a recent survey conducted by an international team of astronomers, a more luminous, massive galaxy was spotted that could provide a clear look at how early galaxies led to reionization. The study which details their findings, titled “ISM Properties of a Massive Dusty Star-forming Galaxy Discovered at z ~ 7“, was recently published in The Astrophysical Journal Letters. Led by researchers from the Max Planck Institute for Radio Astronomy in Bonn, Germany, the team relied on data from the South Pole Telescope (SPT)-SZ survey and ALMA to spot a galaxy that existed 13 billion years ago (just 800 million years after the Big Bang). In accordance with Big Bang model of cosmology, reionization refers to the process that took place after the period known as the “Dark Ages”. This occurred between 380,000 and 150 million years after the Big Bang, where most of the photons in the Universe were interacting with electrons and protons. As a result, the radiation of this period is undetectable by our current instruments – hence the name. Just prior to this period, the “Recombination” occurred, where hydrogen and helium atoms began to form. Initially ionized (with no electrons bound to their nuclei) these molecules gradually captured ions as the Universe cooled, becoming neutral. During the period that followed – i.e. 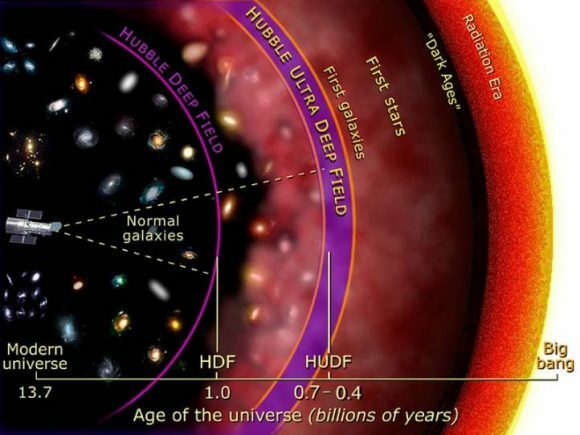 between 150 million to 1 billion years after the Big Bang – the large-scale structure of the Universe began to form. Intrinsic to this was the process of reionization, where the first stars and quasars formed and their radiation reionized the surrounding Universe. It is therefore clear why astronomers want to probe this era of the Universe. By observing the first stars and galaxies, and what effect they had on the cosmos, astronomers will get a clearer picture of how this early period led to the Universe as we know it today. Luckily for the research team, the massive, star-forming galaxies of this period are known to contain a great deal of dust. While very faint in the optical band, these galaxies emit strong radiation at submillimeter wavelengths, which makes them detectable using today’s advanced telescopes – including the South Pole Telescope (SPT), the Atacama Pathfinder Experiment (APEX), and Atacama Large Millimeter Array (ALMA). This was followed by data from ALMA, which the team used to determine the distance of the galaxies by looking at the redshifted wavelength of carbon monoxide molecules in their interstellar mediums (ISM). From all the data they collected, they were able to constrain the properties of one of these galaxies – SPT0311-58 – by observing its spectral lines. In so doing, they determined that this galaxy existed just 760 million years after the Big Bang. From their observations, they also determined that SPT0311-58 has a mass of about 330 billion Solar-masses, which is about 66 times as much as the Milky Way Galaxy (which has about 5 billion Solar-masses). 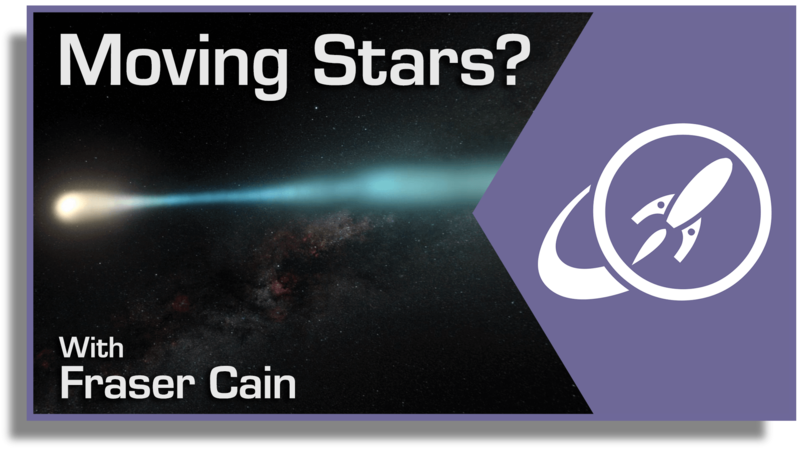 They also estimated that it is forming new stars at a rate of several thousand per year, which could as be the case for neighboring galaxies that are dated to this period. The ability to look deeper into space, and farther back in time, has led to many surprising discoveries of late. And these have in turn challenged some of our assumptions about what happened in the Universe, and when. And in the end, they are helping scientists to create a more detailed and complete account of cosmic evolution. Someday soon, we might even be able to probe the earliest moments in the Universe, and watch creation in action! 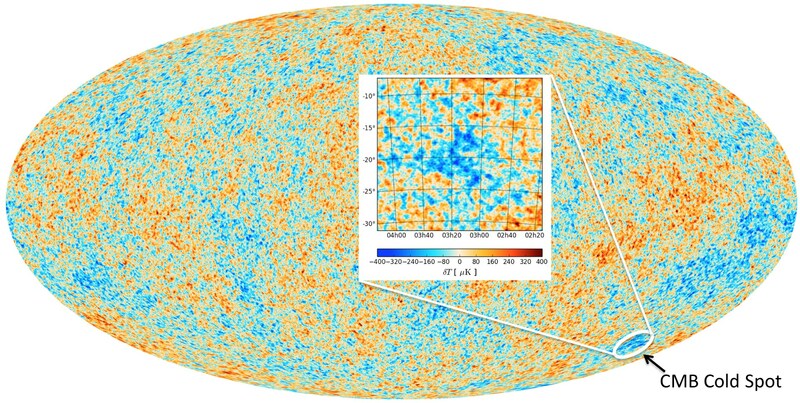 Map of the cosmic microwave background (CMB) sky produced by the Planck satellite. The Cold Spot is shown in the inset, with coordinates and the temperature difference in the scale at the bottom. Credit: ESA/Durham University. The 3-D galaxy distribution in the foreground of the CMB Cold Spot, where each point is a galaxy. Credit: Durham University. Specifically, the Durham team found that the Cold Spot region could be split into smaller voids, each of which were surrounded by clusters of galaxies. This distribution was consistent with a control field the survey chose for the study, both of which exhibited the same “soap bubble” structure. The question therefore arises: if the Cold Spot is not the result of a void or a relative lack of galaxies, what is causing it? Multiverse Theory, which was first proposed by philosopher and psychologist William James, states that there may be multiple or an even infinite number of Universes that exist parallel to our own. Between these Universes exists the entirety of existence and all cosmological phenomena – i.e. space, time, matter, energy, and all of the physical laws that bind them. Whereas it is often treated as a philosophical concept, the theory arose in part from the study of cosmological forces, like black holes and problems arising from the Big Bang Theory. In addition, variations on multiverse theory have been suggested as potential resolutions to theories that go beyond the Standard Model of particle physics – such as String Theory and M-theory. Another variation – the Many-Worlds interpretation – has also been offered as a possible resolution for the wavefunction of subatomic particles. Essentially, it states that all possible outcomes in quantum mechanics exist in alternate universes, and there really is no such thing as “wavefunction collapse’. Could it therefore be argued that an alternate or parallel Universe is too close to our own, and thus responsible for the anomalies we see in the CMB? As explanations go, it certainly is exciting, if perhaps a bit fantastic? And the Durham team is not prepared to rule out that the Cold Spot could be the result fluctuations that can be explained by the standard model of cosmology. Right now, the only thing that can be said definitively is that the Cold Spot cannot be explained by something as straightforward as a supervoid and the absence of galaxies. And in the meantime, additional surveys and experiments need to be conducted. Otherwise, this mystery may become a real sticking point for cosmology! This past Monday (June 27th), the National Astronomy Meeting – which is hosted by the Royal Astronomy Society – kicked off at the University of Nottingham in the UK. As one of the largest professional conferences in Europe (with over 500 scientists in attendance), this annual meeting is an opportunity for astronomers and scientists from a variety of fields to present that latest in their research. And of the many presentations made so far, one of the most exciting came from a research team from the University of Nottingham’s School of Physics and Astronomy, which presented the latest near-infrared images obtained by the Ultra Deep Survey (UDS). In addition to being a spectacular series of pictures, they also happened to be the deepest view of the Universe to date. The UDS survey, which began in 2005, is one of the five projects that make up the UKIRT’s Infrared Deep Sky Survey (UKIDSS). For the sake of their survey, the UDS team relies on the Wide Field Camera (WFCAM) on the United Kingdom Infrared Telescope in Mauna Kea, Hawaii. At 3.8-metres in diameter, the UKIRT is the world’s second largest telescope dedicated to infrared astronomy. Ultimately, the goal of UDS is shed light on how and when galaxies form, and to chart their evolution over the course of the last 13 billion years (roughly 820 million years after the Big Bang). For over a decade, the UDS has been observing the same patch of sky repeatedly, relying on optical and infrared imaging to ensure that the light of distant objects (which is redshifted due to the profound distances involved) can be captured. In total, the project has accumulated more than 1000 hours of exposure time, detecting over two hundred and fifty thousand galaxies – several hundred of which were observed within the first billion years after the Big Bang. The final images, which were released yesterday and presented at the National Astronomy Meeting, showed an area four times the size of the full Moon, and at an unprecedented depth. Data previously released by the UDS project has already led to several scientific advances. These include studies of the earliest galaxies in the Universe after the Big Bang, measurements on the build-up of galaxies over time, and studies of the large-scale distribution of galaxies to measure the influence of dark matter. Along with the subject of galaxy surveys and large scale structure, “galaxy formation and evolution” and “galaxy surveys and large scale structure” were two of the 2016 National Astronomy Meeting’s main themes. Naturally, the UDS release fit neatly into both categories. The others themes included the Sun, stars and planetary science, gravitational waves, modified gravity, archeoastronomy, astrochemistry, and education and outreach. The Meeting will run until tomorrow (Friday, July 1st), and also included a presentations on the latest infrared images of Jupiter, which were taken by the ESO in preparation for the Juno spacecraft’s arrival on July 4th. On June 30th, 1905, Albert Einstein started a revolution with the publication of theory of Special Relativity. This theory, among other things, stated that the speed of light in a vacuum is the same for all observers, regardless of the source. In 1915, he followed this up with the publication of his theory of General Relativity, which asserted that gravity has a warping effect on space-time. For over a century, these theories have been an essential tool in astrophysics, explaining the behavior of the Universe on the large scale. However, since the 1990s, astronomers have been aware of the fact that the Universe is expanding at an accelerated rate. In an effort to explain the mechanics behind this, suggestions have ranged from the possible existence of an invisible energy (i.e. Dark Energy) to the possibility that Einstein’s field equations of General Relativity could be breaking down. But thanks to the recent work of an international research team, it is now known that Einstein had it right all along. What color is the Universe? Turns out this isn’t a simple question, and one that scientists have really been unable to answer, until now! Since it was first launched in 1990, the Hubble Space Telescope has provided people all over the world with breathtaking views of the Universe. Using its high-tech suite of instruments, Hubble has helped resolve some long-standing problems in astronomy, and helped to raise new questions. And always, its operators have been pushing it to the limit, hoping to gaze farther and farther into the great beyond and see what’s lurking there. And as NASA announced with a recent press release, using the HST, an international team of astronomers just shattered the cosmic distance record by measuring the farthest galaxy ever seen in the universe. In so doing, they have not only looked deeper into the cosmos than ever before, but deeper into it’s past. And what they have seen could tell us much about the early Universe and its formation. Due to the effects of special relativity, astronomers know that when they are viewing objects in deep space, they are seeing them as they were millions or even billions of years ago. Ergo, an objects that is located 13.4 billions of light-years away will appear to us as it was 13.4 billion years ago, when its light first began to make the trip to our little corner of the Universe. This is precisely what the team of astronomers witnessed when they gazed upon GN-z11, a distant galaxy located in the direction of the constellation of Ursa Major. With this one galaxy, the team of astronomers – which includes scientists from Yale University, the Space Telescope Science Institute (STScI), and the University of California – were able to see what a galaxy in our Universe looked like just 400 million years after the Big Bang. Prior to this, the most distant galaxy ever viewed by astronomers was located 13.2 billion light years away. Using the same spectroscopic techniques, the Hubble team confirmed that GN-z11 was nearly 200 million light years more distant. This was a big surprise, as it took astronomers into a region of the Universe that was thought to be unreachable using the Hubble Space Telescope. In addition, the findings also have some implications for previous distance estimates. In the past, astronomers had estimated the distance of GN-z11 by relying on Hubble and Spitzer’s color imaging techniques. This time, they relied on Hubble’s Wide Field Camera 3 to spectroscopically measure the galaxies redshift for the first time. In so doing, they determined that GN-z11 was farther way than they thought, which could mean that some particularly bright galaxies who’s distanced have been measured using Hubble could also be farther away. The results also reveal surprising new clues about the nature of the very early universe. For starters, the Hubble images (combined with data from Spitzer) showed that GN-z11 is 25 times smaller than the Milky Way is today, and has just one percent of our galaxy’s mass in stars. At the same time, it is forming stars at a rate that is 20 times greater than that of our own galaxy. Last, but not least, they provide a tantalizing clue as to what future missions – like the James Webb Space Telescope – will be finding. Once deployed, astronomers will likely be looking ever farther into space, and farther into the past. With every step, we are closing in on seeing what the very first galaxies that formed in our Universe looked like.